People like you and I who suffer from Plantar Fasciitis are usually told that the reason is from bad shoes or from the way we are standing. But there is another reason that you might be getting painful heels and soles – your calf muscles might be too tight! When I purchased my orthotics to fix my foot pain, the podiatrist did give me a set of stretching exercises to complete but they did not stress their importance. The muscles and tendons that run down the back of your calf all connect at the foot and join at the heel. If these muscles are too tight, it can pull on the plantar fascia, causing pain, swelling and tearing. This might the reason why you get painful heels, but not pain on the soles of your feet. Luckily, using a stretching device such as the “One Stretch” can really help keep you supple and pain free. Most products you can buy that help you stretch your calf muscles are only designed to allow one level of intensity. You are either stretching, or not – and you are left to manage how far you want to do this on your own. The One Stretch has been designed to address this problem by having a graduated curved surface. The curve has been specially designed by a foot and ankle orthopaedic surgeon to give differing levels of stretch to your upper calf muscles – just the place where it is needed to help relieve your pains. Other stretching devices or products for treating foot pain will have you balancing on your tip-toes, swaying around whilst trying to maintain your posture and keep the stretch going. The One Stretch has addressed this problem and has been made so that when you are using it, you are supposed to put your back against a wall. This gives you extra support and means that you won’t over-stretch too easily. It also means that it is more relaxing and can be used whilst you are watching TV or speaking with your family. Also, because your back is supported, the ability to do more intensive stretches is improved. On other products I have used, I always ended up only stretching for a few seconds before falling off or wobbling about, which you can’t do with this product. The One Stretch has been designed specifically for people who suffer from Plantar Fasciitis and has been created with the help of a foot and ankle surgeon – so you know it’s going to be safe. It is very secure and will not slip thanks to the sturdy design. The stretch is gives you will not put any additional stress on your knees, hips or back. Your hands are also free when using the One Stretch as you are not facing a wall. At the time of writing this review, there are over 35 reviews on Amazon.com and the customers have given an average rating of 4.7 out of 5, which makes it a very popular product that is recommended by many people. One reviewer did complain that after she had used it, the black rubber where your shoes go was starting to scuff and come away, possibly from where she had been using it. I checked the other reviews and could not find anyone else suffering from the same problem and the woman making the original complaint still rated it 3 out of 5 and said that the product was “still functional” and that she “would continue to use it”. So in summary, this product gives you exactly the right calf stretch you need to help prevent Plantar Fasciitis or heel pains. 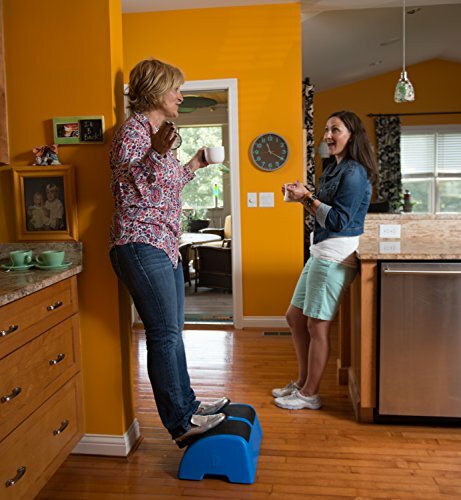 It has been designed by a medical professional and is made from non-slip, sturdy materials. One of the big selling points is the graded stretch the curved surface gives and the way it has been made to be used against the wall. People who have bought this product have been very pleased with it and can’t say enough good things about it in their reviews – we highly recommend it too.